Running late today and a million excuses for it. The best one is that I got a new PC and I am still setting it up, so bear with me. That does not count as a valid excuse for not making dinner tonight in this household and I, therefore, had to come up with all the food groups on one plate in barely 15 minutes as it was also the preview of Loot at the Blue Bridge theater. (Excellent play btw). So now, I will give you this “plat unique” dinner write-up. I started some Jasmine rice in boiling water, just enough so there would be none left when the rice would be cooked. About four cups to one of rice, to boil slowly in a non-stick pot and cover when almost all the water is gone after about 10 minutes, then finish on low heat the last 5 minutes. That will give you a nice sticky rice, as creamy as a risotto. While the rice was cooking, I cut up, 4 orange peppers, 1 onion, 4 Roma tomatoes and sauteed them 5 minutes in olive oil. At this point, I added the salmon filet, a sliced mango and a half cup of chopped cilantro, a sprinkle of hot sauce and the juice of a lime and one tbsp balsamic, then covered the pan for another 5 minutes. The result is quite sweet although there is no sugar at all. Whoops, 15 minutes ‘s up, make a bed of rice on a hot plate, add the vegetables and the salmon on top, add a slice of lime. Dinner for two on the table. That’s all folks! 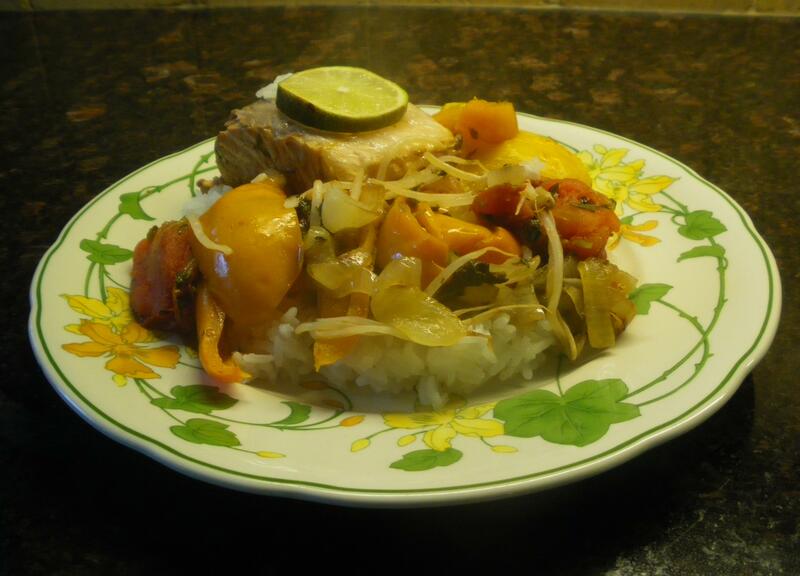 This entry was posted in Main Course and tagged dinner, food, main course, mango, orange peppers, recipe, recipes, salmon. Bookmark the permalink. Please adopt me…I could eat like this for the rest of my life! 🙂 There is no bad salmon as far as I am concerned…but this plate sounds so comforting, infused with wonderful flavors. Fifteen minutes…. I couldn’t come up with that in 15 hours! You are amazing. Yes, eat well for the rest of life, that’s my goal! I’m a big fan of quick and easy recipes. I can’t wait to try this, it sounds really yummy!